Morgan became the Executive Director in the spring of 2016. Previously she had served as the Development and Community Relations Director and led the coordination of signature fundraising events including the annual Run for Shelter 5K, and Tastes & Treasures. She continues to engage with the community, speaking with groups of all ages and affiliations, and helping to coordinate volunteer efforts. In addition, she supports the efforts of staff and clients in our programs to work toward long term solutions to housing challenges and crises in our community. Morgan also coordinates our First Time Homebuyers Program along with the Borough of State College. Please contact her with your questions about how to help, how to donate, and how Housing Transitions works. Annette has been meeting needs and filling a number of different roles in Housing Transitions since 1997. She started in the Centre House shelter, and eventually moved behind the scenes to provide supervisory and program support to our staff. She took on more and more of the financial workings of the organization, and her attention to detail has made her adept and efficient at ensuring compliance with our grants. Recently, in 2017, her position was renamed to Finance Manager to reflect a focus on finances and compliance as our organization has grown. While she provides less of a supervisory role, members of our team continue to seek her experienced knowledge and educated opinions. Kendra has worked with Housing Transitions for over a decade. She started as the Centre House manager, and then worked through a number of different roles, filling in where we needed. Her extensive skill set and expertise have fit well into her newest role as Program Manager, earned in early 2017. 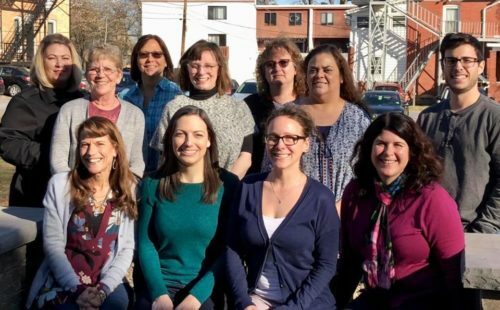 She now provides supervisory support to all of our program staff including those working in Centre House shelter, Bridge Housing, Nittany House I and II, Adult Services Case Management, and Housing Case Management. She also provides support to our Supportive Services Coordinator. Kendra is adept at remaining on top of the requirements of the services we provide and training our staff! After years as the Housing Case Manager, Jennifer was promoted to Centre House Shelter Manager. In this role, she works directly with residents in Centre House, home to the shelter and Housing Transitions offices. In addition to working with clients, helping them set goals, and providing support and guidance during their stay, Jennifer provides leadership support to the Centre House Case Manager and the night shift supervisors who ensure the shelter is professionally staffed 24/7 all year. As the Adult Services Case Manager, Jan helps people, from 18-59 years old, stay in their homes. A master at resource coordination, she assists people on an individual basis to address their unique needs. Often, her clients are challenged with illness or disability affecting their ability to maintain and care for their current homes. She coordinates in-home services to help with the upkeep of the homes provide non-medical care. She provides housing related case management unlike that of any other program in the county. JoAnn joined our staff in the spring of 2017, after working for decades in the New York City area. She brings her expertise in a variety of housing programs to Central Pennsylvania and we are thrilled to have her join our team. JoAnn guides families and individuals who are experiencing homeless or at imminent risk to become homeless. She provides case management,resources referrals, budgeting assistance and goal setting to help people find more independent and sustainable housing solutions. Mary started in October 2017 as the new Rapid Rehousing Case Manager. We were thrilled to receive funding from HUD to be able to offer this new service. Individuals and families who are literally homeless, meaning they have been sleeping in a place considered uninhabitable by humans, or in a shelter, are eligible to apply for security deposit, first month’s rent, and some assistance for a few more months to get into a new apartment. Caitlin joined the Housing Transitions staff in April of 2018 and works with the clients living in Nittany House I and II and Bridge Housing. The Nittany House programs are permanent supportive housing offered to chronically homeless individuals and families with a documented disability. Bridge Housing is available for up to one year for individuals and families who have experienced homelessness. Caitlin most recently worked with people who had experienced homelessness in the DC metropolitan area. Nancy joined our staff as the Centre House Case Manager in the summer of 2018. As the CHCM, she works very closely with the residents of the Centre House homeless shelter program. She meets regularly with each client and helps them set goals for housing security and to take the necessary steps to achieve them. She also coordinates our Emergency Food Pantry and the food provided for residents of the shelter. Ginger joined Housing Transitions in the fall of 2017 as our Development and Community Relations Coordinator. In addition to coordinating outreach and volunteer opportunities, Ginger will lead the way in creating new and fun events for all different demographics. Check our events page frequently to see what great opportunities we have to engage with our organization and help our clients. Ginger will be happy to talk with your organization about ways to help Housing Transitions and our community! In addition, Ginger has taken on hours as our new Supportive Services Coordinator. She works with residents living in a number of scattered site apartment complexes throughout the county that provide affordable and market rate options for individuals and families. She provides referrals, coordinates services and develops community building activities in each place. Susan has had a long term interest and involvement in facilitating affordable housing options in the Centre Region. For Housing Transitions, she manages the budget counseling and home buyer education program for our First-Time Home Buyers (FTHB) program. She also provides post purchase budget counseling for any FTHB who has purchased a home through the Borough of State College programs. In addition, she serves as the owner liaison between tenants and apartment managers in the apartment complexes owned by Temporary Housing Foundation, another branch of Housing Transitions.